I know that I am very lucky to have a space to call my own, a place to sit, to plan and of course to work. It isn’t huge but it is certainly big enough and I know many people do not have a room that can be given over to what they do. My space is just off the dining room, so, close to the comings and goings of the house although this can be a distraction – too easy to nip into the kitchen. I do however spend quite a lot of my time in this room. 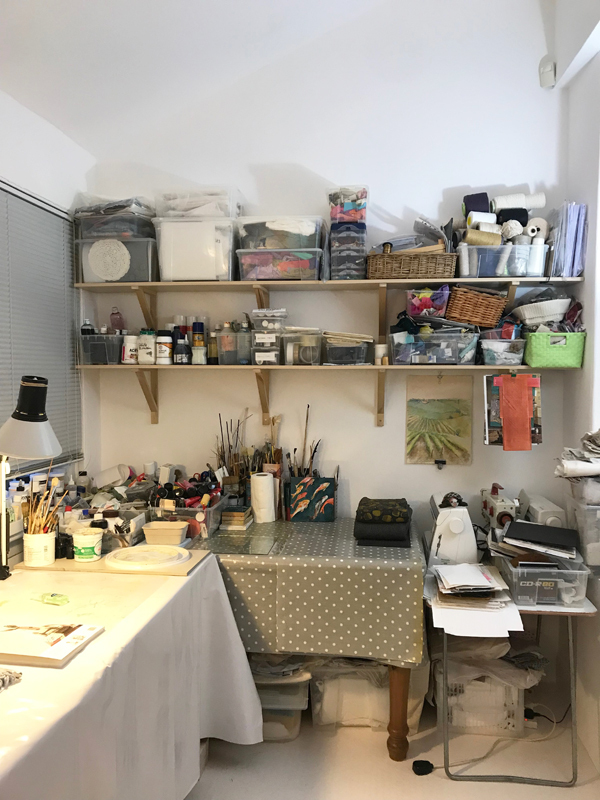 It is packed full of ‘stuff’ – fabric, books, threads, drawing and painting materials, as well as my computer, sewing machine and all the bits and pieces that goes with the work I do. The room faces north and I recently had it repainted and new flooring laid – to make my own white room. The repainting meant that the room had to be emptied – a massive job but good to do. 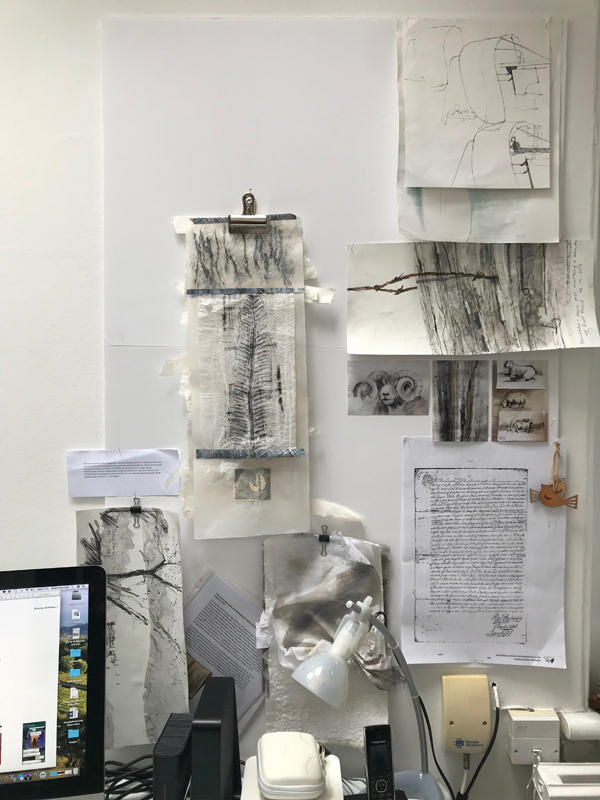 Things had accumulated, as they do, over time, so this was a wonderful opportunity to take out a lot of things that were not essential to my current process and strip the room back to the essentials. Not an easy job but necessary and the room and I are all the better for that clear out. I have two areas within the room. One area is the messy end where painting and mark making is done, the opposite end houses my computer and the books I decided to keep in here. Another table can be used for the sewing machine and I have wall space for hanging up ideas while I think about them. To quote an old Snoopy quotation “Sometimes I sits and thinks and sometimes I just sits”. Love this Sheila! I, too, had a messy area and a clean area in my studio, and gave it up last year as I couldn’t afford it, but have someone coming on Sunday to see if a small one in the garden is possible. I soooooo need a place where I can leave things out – and CLOSE the door on the world! Love the manipulated drawing – the possibilities of what you can do digitally is endless!